We finally managed to get around this scenic loop in the Ruahines, which is almost entirely made up of tops travel. It was a weekend of very nice weather, even though a light easterly in the Ruahines meant walking through some clag. For me personally, it was the first time I’ve connected the dots between two different sides in the Ruahines, having reached the same place from two different sides, and this felt quite rewarding. 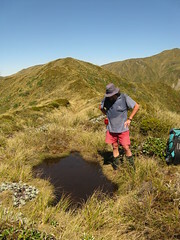 tarns on the way up Te Hekenga. 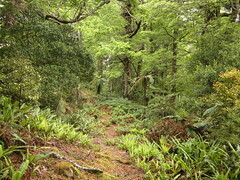 Location: Ruahine Forest Park, Rangiwahia road-end to Heritage road-end. People: Alistair, Dirk, Paul, Amanda, Harry, Steve, Roger, Bernie and me. Huts visited: Rangiwahia Hut (1 night), Howletts Hut (1 night), Heritage Hut (0 nights). Route: Up to Rangiwahia on Friday night. On Saturday, walk past Maungamahue, around the back of Te Hekenga, then to Taumataomekura and Tiraha, and down Daphne Ridge to Howletts Hut for Saturday night. On Sunday, continue to Taumatataua, Otumore, and Tunupo, then descend to Heritage Lodge and out at the Heritage road-end. Levin is a good place to stop for dinner when driving north of Wellington up SH1 on Friday night. People often want to stop at Bulls because it has a kebab shop which some people like, but this time everyone agreed on Levin, and that suits me because I think there’s a wider variety of choices. There’s also a supermarket, which suited Alistair who was last back to the van, carting a 12-pack of toilet paper after he’d realised he never packed any. We reached at the Rangi road-end at about 9.20pm, where a couple of hunters were waiting for their friends from Wellington to arrive before heading up the Dead Man’s Track. In our own group, there was a short delay due to technical difficulties with a torch not working, but that was resolved pretty quickly and we headed up and over the slip to Rangiwahia Hut, arriving after about 90 minutes at 11.10pm. This went the same as every other time, except that I noticed one of the Best DOC Signs Ever has disappeared, that sign being the “The Worst is Over” sign which used to exist at the top of the slip (see my photo from one of the earlier trips). A couple of hunters were hidden asleep at Rangi, and I think they were very polite considering the unassuming noise with which ourselves and another club group slowly filtered in without everyone realising they were there (oops!). They were up and leaving some time before 5am, and despite our entrance, they made an obvious effort to be as undisruptive as possible. Saturday morning came, and those sleeping out on the balcony would have woken to quite an awesome view of Ruapehu lit by the rising sun. Alistair, meanwhile, realised that in the excitement of the night before, he’d once again forgotten to pack any of the 12 rolls of toilet paper he bought in Levin. In the end he made some kind of deal with evil Roger which netted him 1/3 of a roll. It’s not yet apparent which part of his soul Alistair sold, so we can only assume that will make itself more obvious in time. the junction north of Mangahuia. Our group of 9 left Rangiwahia Hut at 7.30am, reaching the junction on the ridge of the Whanauia Range at 8.20’ish, which is very consistent in timing with the four previous times I’ve walked that stretch. The day was already becoming hot. At around 9am we passed a three people sitting in the sun at the top of the spur leading down to Triangle Hut, before sidling (left-side sidling) around the eastern side of point 1635 towards Maungamahue (1661). There were also a couple of hunters wandering around above Maungamahue somewhere, but we didn’t meet them close up as we sidled around it (left-side sidling once again), and towards point 1493 and onto the spur underneath the north-western side of Te Hekenga. 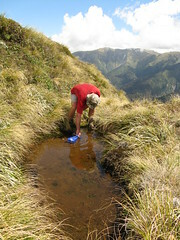 tarn on the side of Te Hekenga. This was the fifth time in about two years that I’ve started at Rangiwahia Hut. Four of those times we’ve intended to get to Te Hekenga (1695) for some reason, and this was the third time we’ve successfully done it, so I’m starting to feel reasonably familiar with the area. 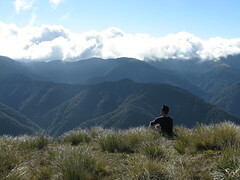 Te Hekenga, on the north-western spur, is divided into about three main sections of climbing, between which it briefly flattens out. There are also a couple of tarns on the way up, or at least there were on this occasion in early December. I guess I’m reasonably fit and I found the first half of climbing Te Hekenga to be very straightforward. The second half was much more of a grind, although I’d attribute this to having drunk two cups of water from the tarn half-way up, mostly because I could. We left the bottom of the spur at 10.50’ish, and reached the top around 11.40 or thereabouts. 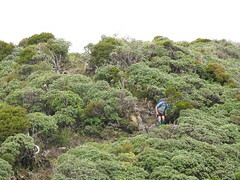 More specifically, Bernie and Steve reached the top, but I don’t think anybody else bothered, and we sidled around the western side (yet again it was left-side sidling) to sit on a short east-west ridge at Te Hekenga’s shoulder and stop for lunch. Getting over Te Hekenga is difficult, if even possible, without being an experienced rock climber. On reaching the top, the peak abruptly drops into a 10 metre vertical rock-face on the south-east, which makes it impossible to continue in that direction. 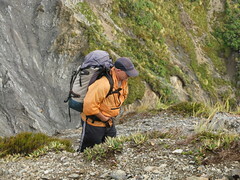 Fortunately, by sidling around it and down the southern side of the ridge on the western side, there’s a very easy-to-follow goat track which crosses the scree of the slips on the southern side, and can be followed around to Taumataomekura (1682). Once again, this is left-side sidling. I think the biggest problem I had on the entire trip was a short stretch of ridge between Taumataomekira and Tiraha (1668), which is at the southern end of Sawtooth Ridge. I don’t even remember this section the previous time I was here, but this time I panicked a little with it being one of those ridges that’s fairly steep and without much to fall onto. Everyone else trundled along the side of it without raising issues, but I was quite glad to get through that 10 metres or so. Alistair and Roger were waiting on the other end for me, almost laughing I think, but I get as much as I give so it was fair enough on their part. We reached Tiraha at about 1.30pm, and sat there for about 10 minutes, watching the clag from a light easterly roll in. It was still a very hot day, and very humid at that. The extra heat over the sea might have been a significant contributing factor to the clouds that were drifting into the eastern part of the range from New Zealand’s east coast, which isn’t too far away in the Ruahine Range. From Tiraha, the final stage of our Saturday journey was to follow Daphne Ridge along to Howletts Hut for Saturday night. 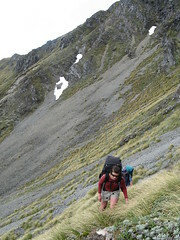 There were a couple of options at this point — several people in the group elected to sidle through the tussock on the inside of the ridge for some distance, but the rest of us followed another goat track along the ridge top. From the latter route, we had an impressive view of the profile of Sawtooth Ridge. It wasn’t until 2.30pm that we actually reached Howletts Hut, but on that particular Saturday night we had it all to ourselves. This was fortunate in some respects because even though there were nine of us for a ten bunk hut, it’s not a large hut and there’s not much space to wander if everyone’s up and walking about. Despite its small size and perhaps partly because of it, Howletts Hut is one of the nicest and most characteristic huts I’ve ever visited. It’s looked after by the Heretaunga Tramping Club, which clearly takes a lot of care of it. So for Saturday, our walk added up to a total of seven hours, although this was at a reasonably brisk pace (though definitely not running). It was too early to prepare dinner, though, and some people were feeling a little drowsy, so we agreed on a schedule of “quiet time” during which nobody was allowed to talk, or something like that… which is not to say that anybody important really took any notice of the rules. 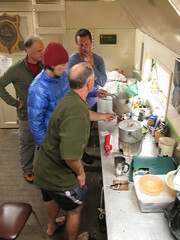 working on dinner at Howletts Hut. Preparations for dinner began at around 5pm, which was very organised thanks to Alistair’s insistence that all the relevant veggies be chopped up and prepared before we left. The recipe was reportedly from page 23 of Gourmet Tramping in New Zealand by Jon Sawyer and Liz Baker, which wasn’t of any immediate help since nobody had actually brought the book or the recipe with them, but Alistair seemed to know what he was doing and he was well armed and matched to the task with his full-body cooking underwear. He delegated Amanda to supervise the pasta cooking, and after much noise in the kitchen we sat down to a fantastic Saturday night dinner, which is a common theme on club trips. My only issue with dinner was that it broke my spoon, since the custard (more like scrambled eggs) was unusually thick… but it was a cheap spoon. On Saturday night, I lay down to read more of my book, Roger and Steve beat Harry and Paul in a noisy game of 500, despite Harry’s claims that he and Paul had been playing the game the way it was supposed to be played, and eventually we went to sleep. The next morning I heard reports that some sod had been snoring all night, but I never noticed them so it was no biggie. On Sunday morning I consumed my rolled oats with the head of a plastic spoon — the ultimate device for weight saving. It was about now when I noticed that very unusually for the Wellington Tramping and Mountaineering Club, especially for a large trip, all nine of us on the trip were native New Zealanders. This meant that we had a group of people who weren’t all just wearing short shorts and gaiters, but were proud of it. It also meant there weren’t any “foreigners” with strange habits like having weird things for brekkie. It was an active morning, particularly because Roger and Bernie were having very noisy laughs. More specifically, Bernie was being as a perfectly constructed sphere of highly enriched uranium whereas Roger was being a detonator. We left Howletts Hut at 6.50am, having risen early with the sunrise. There’s lots of noisy life around the Ruahine tops at the moment, unlike some times of year when it’s very quiet apart from the wind. In particular, there’s a lot of insect life which was evident whenever we stopped, and this is notably different from several other times when I’ve been on the tops in the Ruahines, so I guess it may have been symbolic of warmer temperatures at this time of year. Roger climbing out of the saddle. Our first stop, at about 8am, was at the bottom of the saddle between point 1431 at the end of Daphne Ridge, and point 1271 on the other side. The saddle would be an awful place to cross in strong wind, but today it was just the persistent light easterly which meant that most of the rest of our day would be spent in clag on the eastern side of the range. It was 8.30 before we reached point 1271, and then continued south along the new ridge towards Otumore (1519), and stopped for a few minutes on its shoulder to the north at around 9am, before sidling around passing the sign marking the junction where one would turn off towards Longview Hut (around 9.25am). From here we headed further south over the other point 1519 that’s not Otumore, but which does have the remains of an old trig station (9.35am). At this point the ridge juts over to the west, leading to the top of a major spur that ends up at Iron Gates Hut (we passed a sign at 9.50am), but we instead followed the main ridge further south-west to point 1505 — also a junction at the top of a spur leading down the opposite side, towards Top Gorge Hut. The entire ridge along here is very broad and easy to walk on, and with almost no wind (except for that light easterly bringing in the cloud) we had a rather relaxing walk to our final destination on the tops, known as Tunupo (1568). Tunupo is a deceptive climb, and there are several occasions where the top doesn’t look far away until it’s reached, and then it becomes apparent that there’s still more to go. We reached it at 11am, however, and it was there that we stopped for an early lunch surrounded by insects which tended to blacken anything light-coloured and still, simply by their ferocity of landing on and crawling over things. Now being near the end of the journey, we left Tunupo at about 11.35am, finally heading down the tracked spur towards Heritage Hut. An alternative, which we briefly considered, was to remain on the ridges for a little longer and head further south-west towards Toka (1519), but in the end by now everyone was too fixated on home, and nobody could be bothered. The Ruahines are renowned for being surrounded by a ring of Leatherwood, such that it’s often very difficult to actually get to the tops without following some kind of cut track. 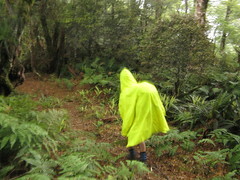 It was helpful, therefore, that this route from Tunupo down to Heritage Hut was well cut. In fact, it appeared as if it’d been cut with the future in mind, because for most of the threading through Leatherwood plants, the track had been cut a good 2-3 metres wide, which I’d expect would keep it very walkable for at least a decade, since Leatherwood grows quite slowly. Having left Tunupo at around 11.30 and onwards, we reached the first significantly big trees about 40 minutes later, and after that we spent the rest of the rather long, shallow-gradient spur beneath the bush-line. and Dirk just threw a poncho over everything. It might have been good timing to get below trees, too, because shortly afterwards we began to get recurring rain showers. They didn’t last for long, and Roger (who’d bounded ahead by a few minutes) claimed he’d never even been rained on, which I guess is a testament to how difficult it is to forecast weather in New Zealand when it can be so extremely localised. I managed to roll my ankle about 2/3 of the way down, but fortunately it wasn’t too serious so after about 5 minutes I was able to walk on it again, and we reached Heritage Hut (often called Heritage Lodge) at 1.30pm after passing 4 or 5 possum traps laid near the end. Heritage Lodge isn’t actually on the route, but is literally a 2 minute side-trip from the junction of the spur we came down with the main track that runs along the true left of Iron Gates Gorge, so it was a handy opportunity to wander up and get some water, as well as to check the hut book to see if another club group had been through earlier in the day as they’d intended. Greenery somewhere above Heritage Hut. We didn’t really leave the junction (2 minutes west of the lodge) until about 1.50pm, and after that we only had a brief, 25 minute walk to the Heritage car-park, ending a nice weekend that was very enjoyable. In summary with good weather and a reasonably fast-moving group of 9 (albeit travelling in a relaxed fashion with several generous stops), we had a 7 hour day to get from Rangiwahia Hut to Howletts Hut (via Te Hekenga) on Saturday, followed by a 6.5 hour day to get from Howletts Hut down to the Heritage road-end, via Otumore and Tunupo. 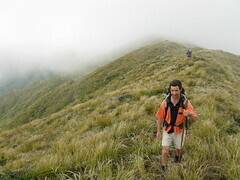 This entry was posted in tramping and tagged bagged:heritage hut, bagged:howletts hut, bagged:rangiwahia hut, ruahines, tramping, wellington tramping and mountaineering club. Bookmark the permalink. Reads like a fantastic trip, that is big stretch of open tops, glad to read you had good weather. As I have written before to you, you guys move faster than my old, and slightly arthritic hip now allow. I have to comment, that as a non native New Zealander I do wear short shorts and gaiters, and feel I qualify to do so on the basis of my time in the Ruahines. To your above post regarding the packs I bought a Deuter Air Contact before my last multiple day Ruahine trip. We still have some getting to know each other to do but it seems pretty roomy and comfortable, and not a bad a bad price. Just returned from the South Island where I had my first bit of a look around. Will be heading back there! Happy Holidays. Hi Robb. Thanks for the comments about the packs. I notice you’ve just put up a new post about your South Island trip, and I’m looking forward to reading it later on. And yes, have an enjoyable holiday season and new year. Hi Sarah. Sorry for taking so long to get back to you — I did see your earlier comment on one of my flickr photos but got a bit tangled up in work things at the same time. Much of the Ruahines is definitely more routes, by the DOC definition. Once you get past the edges, you’ll tend to find you’re just walking along ridges or up and down rivers, and there’s not a lot to clearly tell you how to get from one place to another… often there’s an animal track or occasional gaps between trees or places where you can see where other people have walked before, but there’s also no guarantee that those tracks are going to where you want to go… so in those sorts of places, map and compass skills are very helpful (maybe essential). There will definitely be places where you could go on good 3-4 day tramps in the Ruahines with reasonably nice and well-maintained tracks, and see lots of cool stuff, but it’s not something I could give much useful advice on. (Possibly somewhere around Sunrise Hut on the eastern side for starters since I’ve just been past there last weekend, but I don’t know enough about what’s past Sunrise.) I would suggest getting in touch with Robb, who’s spent a lot of time in the Ruahines and might know a few good tracks off the top of his head. You could also ask for ideas in some of the trampey club forums (the WTMC forum and New Zealand Tramper are good places). Best of luck planning your trip, and if you have any more questions or thoughts I’ll do my best to help out as much as I’m able to. thanks so much for the advice, certainly not negative as i’d still love to get out amongst it in the Ruahines as they seem so wild and off the beaten track but going off what you’ve said it’s probably not the best idea if i go on my own at this stage around the areas you generally frequent, i’m ok at reading maps and compasses etc but don’t have a lot of experience so it would probably be wiser if i head out there with a buddy at some point, unfortunately i’ve not been able to talk anybody else into coming with me this time around. as for portable shelters etc, always a good idea and something i’ll do when i make it out there. Hi Sarah. Not a problem and best of luck with everything. At the very least if you wanted to do something (and keeping in mind I’m very conservative at suggesting things), you could try something like a walk up to Sunrise Hut which is a very good track mostly under trees (very safe as long as you have the standard gear like boots, raincoat, food, etc) and takes maybe 2-3 hours depending on how fast or slow you move, just to get a feel for the place. From there the tops are very accessible, and if it’s a nice day there’s a poled route along to Top Maropea Hut (which I’ve never been to) and you’ll get nice views on a good day. It’s all on map U22 (OngaOnga), which you could buy online if you can’t find it in any local shops. What area are you based in roughly? From what you’ve said it sounds like possibly it’s near Hawkes Bay somewhere, or on the other side near the northern end? Maybe it’s near the Heretaunga Tramping Club, which seems very active and we saw them in the Ruahines last weekend. Federated Mountain Clubs also keeps a list of local member clubs that are scattered around the country. Once you’ve been there 2 or 3 times with people who can talk about it a bit and have a reasonable idea of what to expect, you’ll have a better idea of how to prepare for your own solo things. I wish I could suggest something about the Kaimanawas too, but I’ve only been there once so far. They’re quite far away from Wellington to get to easily in a weekend, and there’s a big hole of private land chopped out of the middle of them which is a bit annoying if you’re trying to plan a nice walk, but there are still lots of places around the outside. HI Sarah. Well it looks as if Robb suggested a few options, in far more detail and with more background knowledge than what I could hope to offer. If you choose to go ahead with it then I hope you have a fantastic time. Tramping clubs work for some people but not for others, and you really have to find one with the right sorts of people for it to work out for you, so don’t be too concerned if it doesn’t really appeal. Thanks again, you’ve been a great help. I’ve decided to pass on tramping over easter, sadly i’m having a few car issues but this is most definitely a postponement and not a cancellation. I’m leading this trip for the WTMC in three weeks and Amanda suggested I contact you. Leaving a public comment as requested on your About page. I’m just wondering if you can remember a bit more specifically how you got past/around Te Hekenga. Presumably you left-sidled around Te Hekenga from NW to SW, but did you then drop down and between the slips, and under the slip S of Te Hekenga? Or did you keep sidling and pass directly over the slip? How dangerous would it be this time of year with a bit of snow there? Hi David. No worries. Yeah, I just got a bit irked after a couple of occasions a few years back when people got me to write out some lengthy descriptions and advice in private email and then never responded or said thanks or anything. I don’t mind if I feel I’m writing it where everyone can actually see it, but being in private it seemed as if they’d just wasted my time. Uh, yeah. So you’d be hopping up Te Hekenga like a kiwiroo from the curvy saddle thing to the north-western side (right?). You pretty much can’t go south-east straight off the top of Te Hekenga and follow above the slip (unless you’re seriously into climbing), because there’s a steep rocky face in that direction which prevents that. So rather than go right to the top, you’ll sort of want to drop down to its southern side from about 2-3 minutes walk west of the peak, between the two slips as you noted. Follow your nose but I think as soon as you could see a reasonable way down would be good enough. The main aim is to get low enough to be able to walk onto the slip and be below the bottom of the rocky face underneath Te Hekenga. 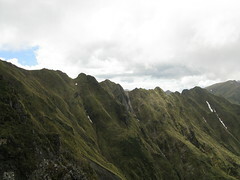 Here’s a photo looking back at Amanda just after dropping down from the ridge which runs westwards from Te Hekenga (somewhere behind the top right corner of the photo). You’ll probably find a goat track of some sort going down there anyway, but from there it’s just a case of walking south-east across the slip. The other photo (also in the report above) is 7 minutes later, showing Amanda soon after she’s crossed the slip. After this, we’d have climbed back up towards the right of the photo onto the top of the ridge between Te Hekenga and Taumataomekura. The slip’s quite stable, as slips go at least. I’m afraid I haven’t been there in serious winter conditions. If conditions are such that you can get that far in the first place then I wouldn’t anticipate anything extra unusual if you’re equipped for the potential conditions with things like ice-axes and stuff, but it’s not my forté and you might want to talk to someone else closer to home about it if you’re not sure, or check later on the off chance that someone else comments here. Hopefully this is helpful, and yell out if you need some clarification on anything else, and have a great time. The Ruahines can be cold and windy in winter (or alternatively clear and sunny) but they’re also the second most awesome range to go tramping in. If it helps, there’s another description of the same route in this report from when we eventually went over Sawtooth. Thanks Mike. Was really hoping to avoid having to take ice axes, etc. but have seen some horrific ice on the way up to Rangi from the carpark at this time of year, so not too sure. Not a problem. It’s impressive if you’ve seen ice just up to Rangiwahia. Was that the direct route or via Deadmans? You might be fine without snow gear (again depending on conditions), but I guess I’m reluctant to give advice on that because I wouldn’t typically do such a trip without getting advice myself (or being with someone I trusted more than me). I’ve been in the Ruahines on occasion where there’s just been one little 20 metre slope or so where it was great to have an ice-axe, and without it we might have turned around. That said, I know certain other people who would’ve happily just kicked their boots in and walked where I would’ve been more nervous. Direct route, about 20m-long patch above and below the waterfall. Had to throw rocks to break it up and make some foot holds. Will keep an eye open and see if there are any major snow falls between now and then. Finally got around to doing this trip last weekend with WTMC after calling it off twice over the last year due to bad weather, etc. It was a great walk, and we had sunny skies and great views for the whole two days. Trip up to Rangi took 1:20. They are making a lot of upgrades to the track, and look like they are going to go with switchbacks to make the section up and over the slip a bit easier, with the new track opening soon. Lots of stairs have gone in as well. Saturday we took about 8:00 to Howletts. We were all a bit slow because we weren’t confident of finding water on route and so took about 3L-4L each. There were one or two sad-looking tarns, but many were completely parched, so was probably the correct decision. This was after a record drought though, after a bit of rain there would be water refills every half-hour or so. The route down and around Te Hekenga is a bit easier than I feared; as long as you know to look for the goat track it is pretty obvious where you should be walking, although that may not be true with snow cover. Took just over 7:00 out the next day. The first section south of Howletts across Daphne ridge was pretty overgrown and a bit of a leatherwood bash in places, but otherwise a fantastic day of walking. Hi David. Thanks for the summary, and great to catch up with you the other night. Interesting what they’re doing with that slip at Rangi. I wonder if that means someone’s decided to leave the hut where it is—probably much cheaper. For a while now, there’s been a rumour that it was going to be shifted closer to the top of Deadman’s Track, to make it more family-accessible again. Yeah, getting around Te Hekenga isn’t too bad once you know where to go. Cheers.